Zach and Zeke were excitedly looking forward to the family reunion. They loaded the last suitcase into the back of the car, slammed the trunk closed, climbed into the backseat, and carefully buckled their seatbelts. At the reunion, there would be aunts, uncles, and cousins they hadn't seen in several years, and also some relatives they had never even met. As they were discussing the reunion and who they might see there, they remembered an unpleasant incident. "I surely hope Mitch doesn't come," Zach said. "Yeah!" Zeke agreed heartily. "He's the one that got everybody calling us the Z-Zs." "Yeah, I remember," Zach replied. "And as if that wasn't bad enough, he called us the snoozies, and before the weekend was over, he named us Zip and Zit. I really, really hope he doesn't come!" Much to the boys' dismay, when they finally got to the reunion and got out of the car, the first person to meet them was none other than their cousin Mitch. "Ugh, he's here!" Zeke whispered to Zach with a frown on his face. Upon seeing their angry faces, Mitch became repentant. "Hi, guys," he said quietly. "I hope you will forgive me for calling you names the last time we were together. I didn't understand how hurtful it could be, but now I do." Mitch went on to explain how badly he felt when some of his classmates started calling him names like Mitch the Itch and Mitch the Snitch. Zach and Zeke laughed for a moment, then saw the pain on Mitch's face. "We're sorry for laughing," they apologized. "Let's all forgive one another and play ball!" As Jacob and his family were traveling on their way to Canaan, he met some angels from the Lord. Now, if you remember the first time Jacob saw angels, you know that he was very afraid. He even thought he had died and gone to heaven. However, this time when he recognized the angels, he wasn't afraid at all. He simply gave a name to the place where he met them and then continued on his journey. 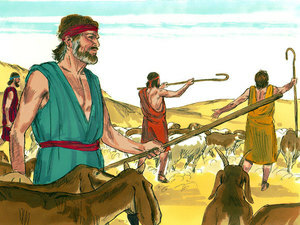 Nearing Canaan, Jacob called a few of his servants to his side. "Jeb, Aram. Go ahead of me into Canaan and tell my brother Esau that I am coming. Tell him I have been working with Uncle Laban the past twenty years and I have many herds, flocks, and servants. Tell him I wish to come in peace," Jacob instructed. "Then come back and tell me if he is glad I am coming or if he is mad." The servants ran on ahead as they were told, and it wasn't long until they came back to Jacob with a report. "Esau is coming to meet you!" they exclaimed. "He has 400 men with him." Hearing those words made Jacob greatly afraid. The servants didn't say whether Esau was coming in peace or if Esau still hated him and brought those 400 men to make war and kill him. Jacob decided it was in his best interest to prepare for the worst. 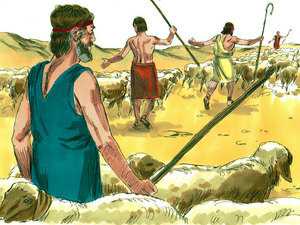 He instructed his servants to divide all the flocks, herds, and camels into two groups. 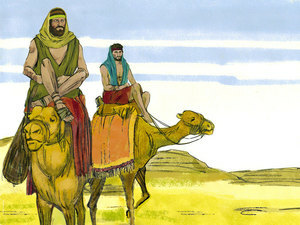 One group would go ahead of Jacob and his family, and the other group would follow behind. He reasoned that if Esau was angry and was coming to make war, the first group might all be killed but he and his family and the second group would have enough warning that they could turn around and escape. After dividing all his animals into two groups, Jacob found himself a place to pray. "O God of my grandfather Abraham and of my father Isaac, you told me to return to Canaan. You promised that all would be well. Please protect me from Esau. I am fearful that he will kill all of my family. You said you would do good to me and bless my family. Please keep your promise." After Jacob prayed and begged God to protect his family and himself, he decided to camp overnight in that spot. He was growing quite restless and had a hard time sleeping. While he was tossing and turning, he decided it might be a good idea to send a gift to Esau. He was thinking that perhaps a nice big present would make Esau happy and help him to forget the awful things Jacob had done to him in the past. Since he couldn't sleep anyway, he got up and gathered 220 goats, 220 sheep, 60 camels, 50 cattle, and 30 donkeys. He put a servant in charge of each group of animals and sent them ahead of him, putting a large space between each group. He instructed each servant that when he met Esau, he was to present the animals as a gift, and tell him there were more coming and that his brother Jacob was following behind. The servants obediently followed Jacob's orders. After he had divided the animals, he still couldn't sleep. He got up again and woke up his wives and his children. He sent them across the Jabbok Brook, and he stayed behind. Just when Jacob decided he had done all he could do and was hoping to finally get some much needed rest, a man came out of nowhere and started wrestling with him. They wrestled all night long! Just as the sun was peeking out over the distant hills, the man grabbed Jacob's thigh, dislocating it and causing him a great amount of pain. The man asked Jacob to let him go, but Jacob didn't. Jacob turned to the man and said, "I'm not giving up that easily! I won't let you go until you bless me!" He kept wrestling, even though he was badly hurt. The man asked, "What is your name?" Of course, Jacob replied: "My name is Jacob." The man said, "Oh no. You will no longer be called Jacob, which means deceiver. Your new name will be Israel, which means prince. From now on, you will have power with God and power with men." Jacob asked, "Who are you?" The man replied, "You don't need to ask who I am," and he pronounced a blessing over Jacob. Jacob didn't need to ask who the man was. He already knew that the man he had been wrestling with was not a man at all; rather, he was an angel of God, or maybe even God himself. Jacob named the place Peniel, meaning, I have seen God face to face and lived to tell about it. The sun was high up in the sky when the angel left Jacob. Even though Jacob hadn't had any sleep, was in a great deal of pain, and even walked with limp, it didn't seem to matter. He had a lot more courage because he knew that God was truly with him. 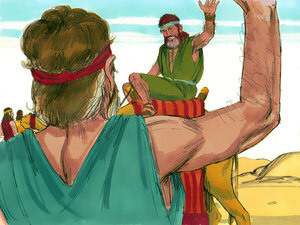 Jacob looked into the distance and could see Esau coming toward him with his 400 men. He divided his children into four groups with their mothers, and then he ran in front of them to meet Esau, bowing seven times as he made his approach. Esau was also running to meet Jacob, and gave him a big bear hug, and kissed him, and they both wept tears of joy at seeing one another after so many long years. 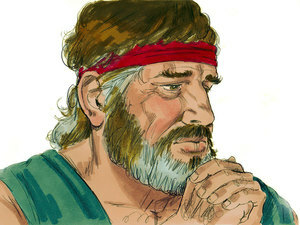 Esau looked over Jacob's shoulder, saw the women and children, and asked, "Who do you have with you?" "These are my wives and the children which God has graciously given me," Jacob replied. First Bilhah and Zilpah and their children bowed to Esau. Then Leah and her children stepped up to the front and bowed. 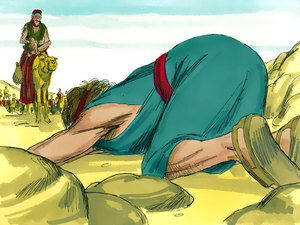 Lastly, Rachel and her son Joseph bowed before Esau. "What was the meaning of all the droves of cattle, sheep, goats, and other animals that I met on the way?" Esau asked Jacob. "I sent all of them ahead as a present for you, hoping that you would accept the gift and not be angry with me," Jacob replied repentantly. 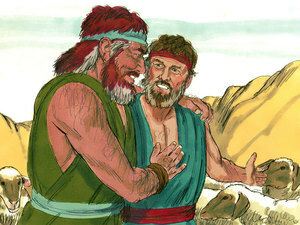 Esau was much more good natured about the meeting than Jacob had expected. "I have plenty of animals of my own," he explained. "You keep them for yourself. I don't really need them." Jacob wouldn't hear of it. "No, no," he replied. "The Lord has richly blessed me, and I want you to be blessed. Seeing your face and knowing that you are not angry with me, is all that matters to me. Please accept the gift I have offered you." 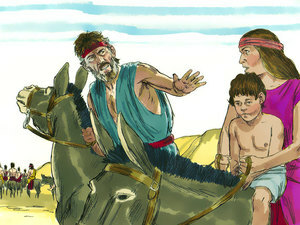 Esau finally agreed to accept the gift and offered to go the rest of the way home with Jacob. 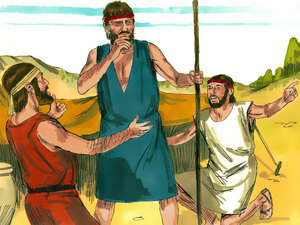 Jacob turned down his kind offer, knowing that Esau needed to hurry along and would move fast. He was worried that the children and the young animals wouldn't be able to keep up the pace. Upon hearing that explanation, Esau then offered to have some of his servants go with Jacob and help take care of the animals. Esau went ahead of Jacob to his home in Seir, and Jacob agreed to meet him there as he passed through on his way to his old home. Both brothers were excited about the happy reunion. Jacob was especially grateful that Esau had so graciously forgiven him of all the past wrongs he had done. Why was Jacob afraid of his brother Esau? Why did Jacob send a gift to Esau? What did Jacob do after he divided the animals into groups? What was Jacob's new name? 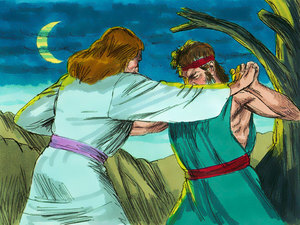 Was Esau angry or happy to see Jacob? God can help us restore broken relationships. and with men, and hast prevailed" (Genesis 32:28). us. In Jesus' Name. Amen. Copyright © 2018 by Linda Sue Pochodzay Edwards. You may NOT re-post this Bible story. when they click on the link.